Mesobuthus caucasicus (Nordmann, 1840), s.str. is now restricted to the Caucasus Moutnains. Its is distributed in Armenia, Azerbaijan, Georgia, Iran, Russia (northern Caucasus), Turkey, Ukraine (unclear if this population is native or introduced). Mesobuthus nenilini Fet, Kovarik, Gantenbein, Kaiser, Stewart & Graham, 2018 (Uzbekistan). Mesobuthus parthorum (Pocock, 1889) (Afghanistan, Iran, Turkmenistan). The article has an identification key to the Mesobuthus complexes and species (excluding taxa from China, Mongolia and Korea). 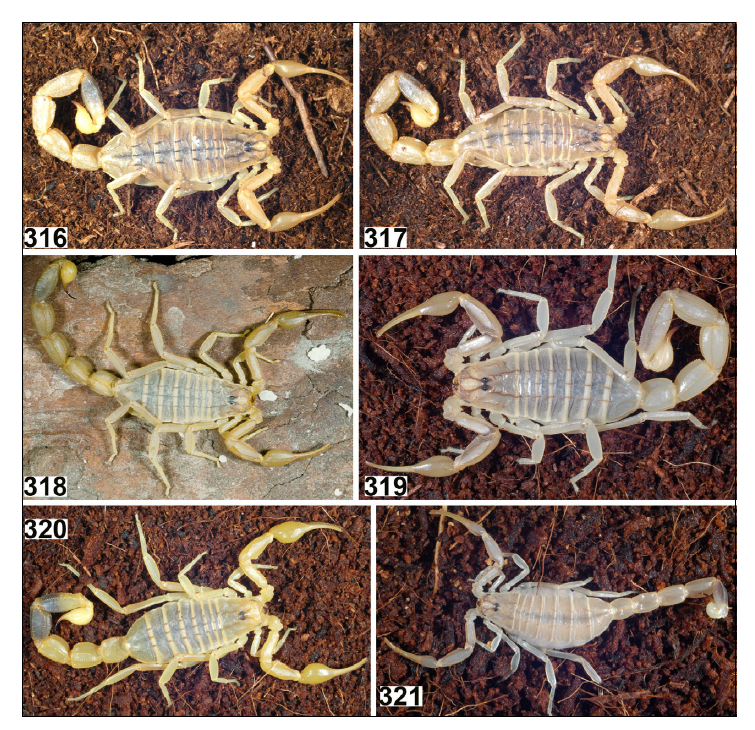 A widespread Mesobuthus caucasicus complex, which includes some of the most common scorpions found from the Caucasus to China, is revised for the first time based on new extensive collections from Central Asia, using both morphological and DNA marker data. Mesobuthus caucasicus (Nordmann, 1840), s.str. is restricted to the Caucasus Mts. Four taxa are elevated to species rank: M. fuscus (Birula, 1897) (Tajikistan), M. intermedius (Birula, 1897) (Tajikistan), M. kaznakovi (Birula, 1904) (Tajikistan, Uzbekistan), and M. parthorum (Pocock, 1889) (Afghanistan, Iran, Turkmenistan). Six new species are described: M. brutus sp. n. (Iran), M. elenae sp. n. (Tajikistan, Uzbekistan), M.gorelovi sp. n. (Kazakhstan, Turkmenistan, Uzbekistan), M. kreuzbergi sp. n. (Tajikistan, Uzbekistan), M. mischi sp. n. (Afghanistan), and M. nenilini sp. n. (Uzbekistan). The most common species in Central Asia is a psammophilic Mesobuthus gorelovi sp. n., widespread through lowland sand deserts across Turkmenistan (Karakum),Uzbekistan (Kizylkum), and Kazakhstan (north to Baigakum and Moyinkum). A key to all studied species isprovided. A DNA phylogeny based on COI and 16S rRNA markers is presented including nine Central Asian species (M. elenae sp. n., M. fuscus, M. gorelovi sp. n., M. intermedius, M. kaznakovi, M. kreuzbergi sp. n., M.mischi sp. n., M. nenilini sp. n., and M. parthorum) and M. caucasicus from Turkey. A deep phylogenetic diversity across Central Asia is revealed. Historical biogeographic scenarios for this scorpion group are discussed, including fragmentation in mountain valleys and expansion across sand deserts in Central Asia. The monotypic scorpion genus Afghanobuthus Lourenço, 2005 and its single species A. naumanni Lourenço, 2005, from Afghanistan, are demonstrated to be junior synonyms, respectively, of Mesobuthus Vachon, 1950, and M. parthorum (Pocock, 1889) from the same area.